If you want to remotely view the screen on a Mac with another Mac, or from an iPhone or iPad to a Mac so you can work collaboratively or help fix a problem at a distance, you've probably been wondering how to set up a remote desktop connection. There are several different ways to screen share, and even to enable remote computer access; we'll go through all the possibilities including the easiest option of all, FaceTime, as well as screen sharing and control with iMessage, and screen sharing Mac to Mac. Let's get started going over our screen sharing options for Mac to iPhone and iPad, and screen sharing Mac to Mac. This screen sharing solution is elegant in its simplicity with no complicated instructions needed; all you need to do is start a FaceTime call and have the recipient point their iPhone or iPad at the screen you need to view. Of course, you can't control their computer using this method, but you can troubleshoot, help diagnose a problem, and offer possible solutions. Open your Phone app and choose the contact you'd like to FaceTime. Tap the FaceTime icon to initiate your video call. Go to the contact you'd like to video chat with and tap on the video camera icon to initiate the call. If you want to be able to not only see the screen on someone else's Mac, but also open apps; move, open, and close windows and files; and even restart their Mac, they'll need to turn on Screen Sharing. If you want someone else to be able to see and control your Mac's screen, or even to be able to remotely view and control it yourself, you'll need to turn Screen Sharing on for your Mac. Let's get started learning how. Click on the Apple menu on your Mac, then click System Preferences from the drop-down menu. If Remote Management is selected, deselect it, then select Screen Sharing. Now you'll need to choose who to share your screen with, you can choose All Users or Only these users. All Users is great if, for example, your Mac is connected to a network server at work or school and you'd like to screen share with anyone on that server. Only these users is the right choice for someone who'd like to share with just a few select people. If you select Only These Users, you'll be able to add and subtract members to your sharing group by clicking the plus or minus under the Allow access option. Once you click the plus sign you'll be able to choose someone to share with from Users & Groups; this includes everyone who uses your Mac except guest users and Sharing Only users. You can also choose one or more people from Network Users or a group of people from Network Groups; these options are all within your Mac's network server. For even more options, click on Computer Settings. Now you can choose Anyone may request permission to control screen, or VNC viewers may control screen with password, or both. With the VNC viewer option people with a VNC app like VNC Viewer can share your Mac's screen. After you have permission, you can see and control the screen of another Mac on your network. To do this you'll need the name and address of the Mac you want to share. This information can be found in the Sharing screen of System Preferences that we visited in the step above. You'll see a gray sidebar; in the Locations section click Network. Double-click the name of theMac you want to share, then click Share Screen. If you don't see the Mac you want to screen share with in Locations, hold the pointer over the word Locations, then click Show. Go to the Finder again and click on Go in the menu bar. Click on Connect to Server. 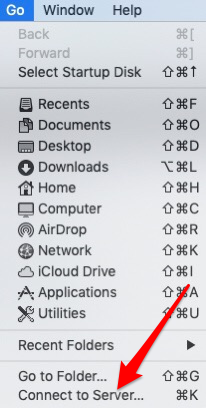 Enter the address of the Mac you want to screen share with, then click Connect. If both Macs are logged in with the same Apple ID the screen sharing session will start automatically. If the Macs are logged in with different Apple ID's, you’ll need to enter the user name and password for someone who is allowed screen sharing access on that computer, or you'll need to request permission to screen share. If another person is already connected to the Mac as a remote user, you'll have the option to Share Display with the other remote user or Log In and use a different user name and screen. If you choose Log In, you'll be on the Mac with the other remote user, but you won’t screen share with them. Open the iMessages app and start a conversation with the person you'd like to share with. Now click the Screen Share button. You'll have the options to Invite to Share My Screen or Ask to Share Screen. You can accept your friend's sharing reqest, or they can accept yours, depending on who is sharing a screen with whom. Once the call is accepted the audio will start and the Screen Sharing app will open. You'll receive an invitation; click Accept. You'll be given the option to let the other person control your screen or just observe it, click on Control My Screen, then click Accept. Click on "allow ___ to control my screen." You'll see a check mark after you've sucessfully selected them. To remove this permission, just click again to remove the check mark.